The former Venezuelan legislator has been implicated in the assassination attempt against president Maduro. August 10 (teleSUR) Venezuela has called on Colombia to extradite former legislator and head of the National Assembly, Julio Borges. The call comes after authorities found evidence linking Borges to the attempt to assassinate President Nicolas Maduro on August 4. 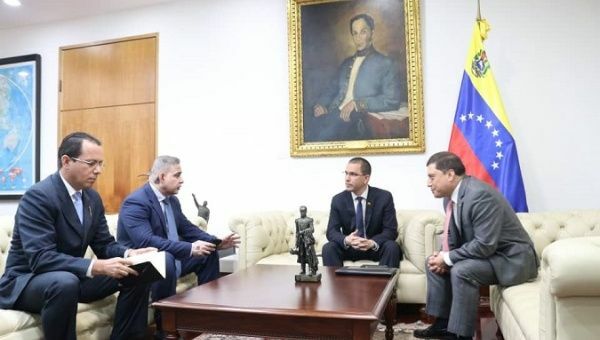 Foreign minister Jorge Arreaza announced the request after a meeting with Augusto Blanco, an advisor in Colombia’s embassy in Caracas, and Venezuelan Attorney General, Tarek William Saab. During the meeting, the two Venezuelan officials provided details of the attack and the ongoing investigation to substantiate the case for extradition, including the exact location of the Atlanta estate, where the attack was planned and the group who carried it our were trained. Officials also requested the extradition of retired colonel Oswaldo Garcia, Gregorio Yaguas, Yilbert Escalona, and an immigration official in Colombia Mauricio Gimenez, all of whom are implicated in the attack. Venezuela’s judicial branch and its National Constituent Assembly (ANC) removed Borges’ parliamentary immunity “given that he is implicated in the testimony provided by the material and intellectual authors captured thus far,” Arreaza explained. According to Arreaza, Blanco committed to working with Venezuelan authorities on the matter. However, after the meeting took place, Borges met with Colombia’s recently appointed Foreign Minister, Carlos Holmes, to discuss the “Venezuelan crisis.” Borges tweeted Thursday he was also seeking support from Colombian authorities. During the press conference, Arreaza called on Venezuelans and foreign governments to ponder the consequences of the attack. “It has been very delicate, and one asks for reflection from all the governments of the world, from our people, from those who sympathize, from those who support the Bolivarian Revolution and from those who do not, what would have been the consequences of having succeeded in this plan,” he lamented.